SAN FRANCISCO... We’ll check in to the beautiful Hyatt Regency Burlingame on San Francisco Bay. Walk down Lombard Street, the world’s crookedest, grab a bite at Pier 39 or on the Berkeley campus, then dessert at Ghirardelli Square. We’ll take in a Giants’ or A’s night baseball game. Have dinner at the Hard Rock Café and take a Night Cruise and Tour of Alcatraz Island ($25 value). Walk across the Golden Gate Bridge to explore the charming Sausalito waterfront, take a cable car to a Chinatown banquet, and a night of dancing at our cool West Coast Dance Club! WHITEWATER RAFT TRIP... 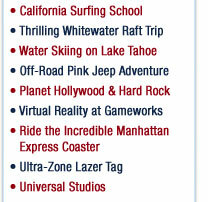 Shoot the rapids on a great professionally-guided rafting adventure on the American River. 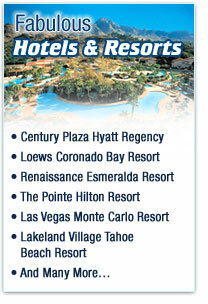 This leads up to one of the most beautiful and fun-filled stops on your trip... LAKE TAHOE... Spectacular Lakefront Resort...It’s condo-living for you and your friends...cook up your own breakfast and dinner.Try water skiing, with professional instruction, or tubing, kneeboarding, wakeboarding, paddle-boating, kayaking on this fabulous lake. Relax on the beach, play beach volleyball, swim the beautiful blue waters. At night it’s Magic Carpet Mini Golf. MONTEREY/CARMEL... See incredible undersea life at the fabulous Monterey Bay Aquarium. Visit the Original Cannery Row and Fisherman’s Wharf. Take the Seventeen Mile Drive off the Pacific Coast Highway to Seal Rock and the Lone Cypress, then play beach footbal or just relax on the white sand of this world-famous California resort area.